We offer open source products as well as items that we design and produce on our own: XD Design. All of them functional and good quality. 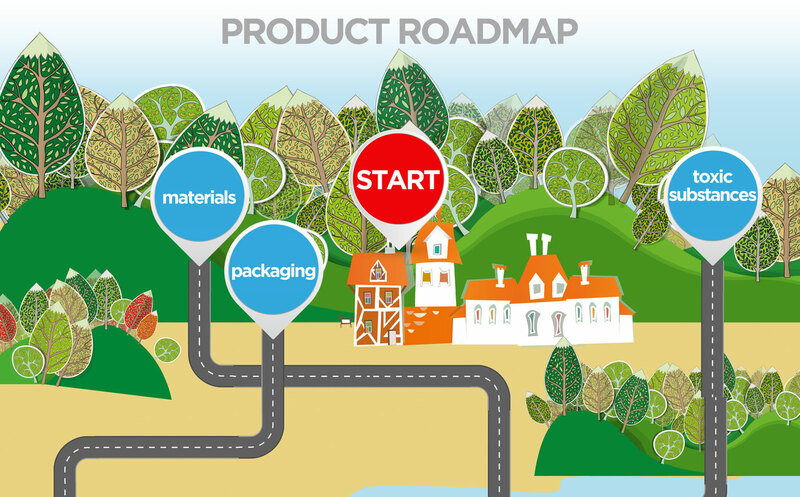 With XD Design sustainable thinking starts in the very first stages of the developing process. In selecting open source products we will become ever more critical on the eco-aspects and aim to eliminate the negative impact on the environment. What will be looking at? By the end of 2014 10% of our XD Design collection is manufactured with a minimum of one of our five criteria. By the end of 2014 5% of our total collection is manufactured with a minimum of one of our five criteria. 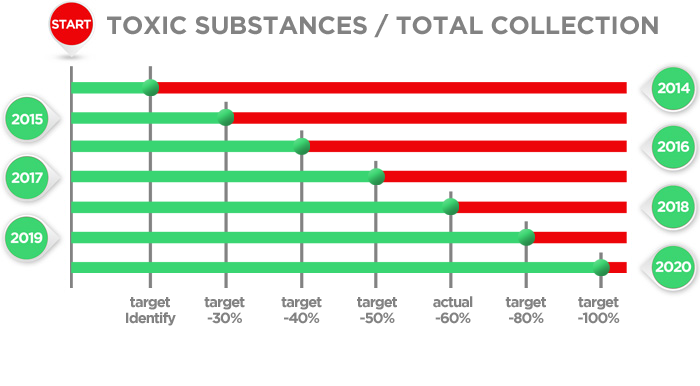 2014 identify all toxic materials in our products. By the end of 2014 50% of all products are PVC free. By the end of 2015 20% of our XD Design collection is manufactured with a minimum of one of our five criteria. By the end of 2015 30% of our total collection is manufactured with a minimum of one of our five criteria. By the end of 2016 40% of our XD Design collection is manufactured with a minimum of one of our five criteria. By the end of 2016 40% of our total collection is manufactured with a minimum of one of our five criteria. By the end of 2016 40% of all our products contain no hazardous materials. By the end of 2016 70% of all products are PVC free. By the end of 2017 70% of our XD Design collection is manufactured with a minimum of one of our five criteria. By the end of 2017 50% of our total collection is manufactured with a minimum of one of our five criteria. By the end of 2017 50% of all our products contain no hazardous materials. By the end of 2017 80% of all products are PVC free. By the end of 2018 100% of our XD Design collection is manufactured with a minimum of one of our five criteria. By the end of 2018 65% of our total collection is manufactured with a minimum of one of our five criteria. If local Government laws allow it, is our target to have all manuals digitally by 2018. By the end of 2018 60% of all our products contain no hazardous materials. By the end of 2018 90% of all products are PVC free. By the end of 2019 100% of our XD Design collection is manufactured with a minimum of one of our five criteria. 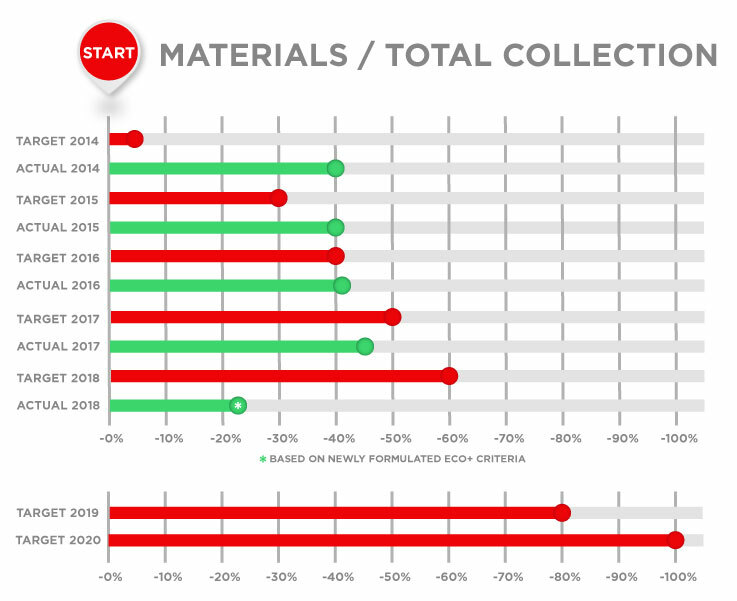 By the end of 2019 80% of our total collection is manufactured with a minimum of one of our five criteria. If local Government laws allow it, all manuals are digital since 2018. By the end of 2019 80% of all our products contain no hazardous materials. By the end of 2019 95% of all products are PVC free. By the end of 2020 100% of our XD Design collection is manufactured with a minimum of one of our five criteria. By the end of 2020 100% of our total collection is manufactured with a minimum of one of our five criteria. By the end of 2019 100% of all our products contain no hazardous materials. By the end of 2019 100% of all products are PVC free. In the use of sustainable materials we will invest continuously to be at the forefront, using: recycled, biodegradable or other environmental friendly materials ( i.e. bamboo). Designed for disassembly for easy recycling and/or re-useable (second life). In 2020 100% of the collection must be manufactured with a minimum of one of the above circular criteria. 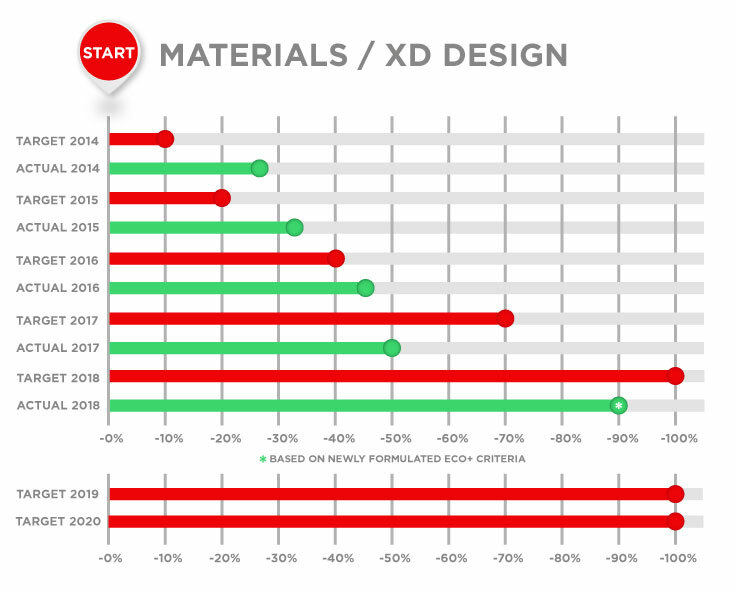 GOAL: By the end of 2018 100% of our XD Design collection is manufactured with a minimum of one of our four criteria. RESULT: In 2018 we achieved 90% or our XD-Design collection being manufactured according to the new criteria formulated in 2018. GOAL: By the end of 2018 65% of our total collection is manufactured with a minimum of one of our four criteria. Less is more, especially in packaging. We will reduce sizes, skip inner cartons and polybags. And we will switch to environmentally friendly packaging materials while recycling will be promoted. 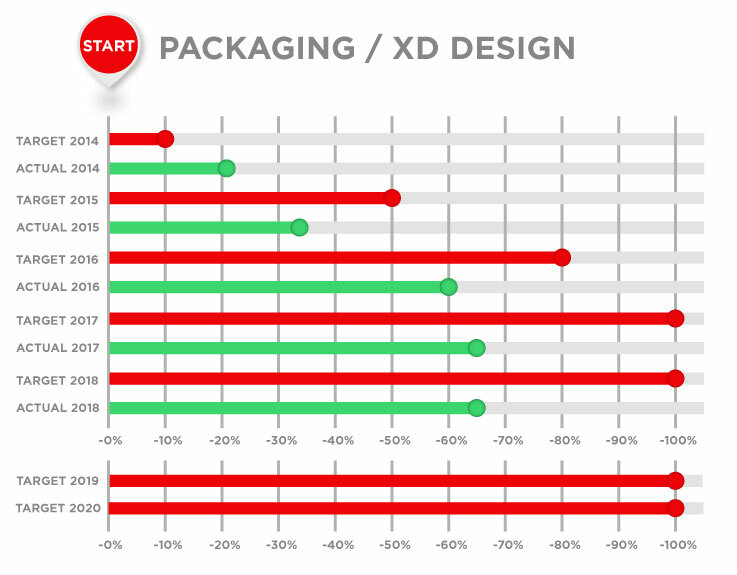 RESULT: In 2018 we reached 65% on environmentally friendly materials in our XD-Design packaging. 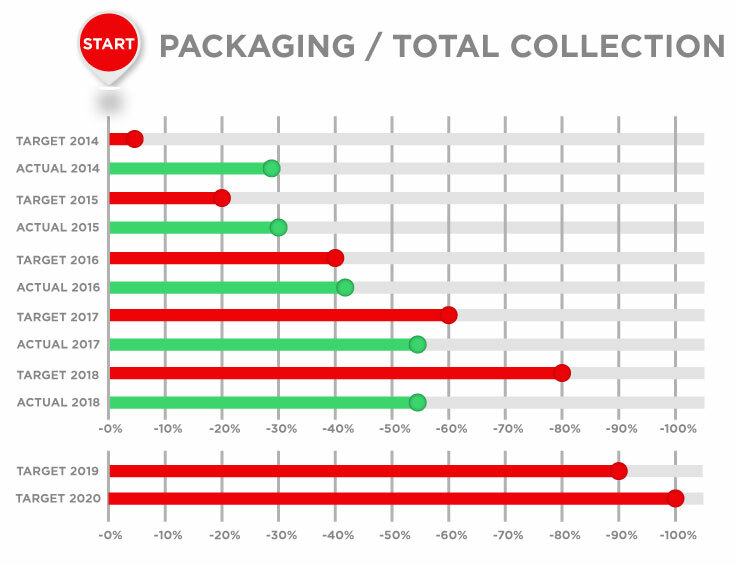 RESULT: In 2018 we reached 55% of our packaging with FSC paper or other environmentally friendly materials. GOAL: If local Government laws allow it, is our target to have all manuals digitally by 2018. RESULT: Unfortunately legislation dictates that we cannot only provide digital manuals, therefore this target could not be reached. We will eliminate all hazardous toxic substances from our products. Aiming higher than the laws that are already in place. Identify all toxic materials in our products. GOAL: By the end of 2018 60% of all our products contain no hazardous materials. RESULT: In 2018 we achieved 80% on no hazardous materials in our products. This does not mean 20% of our products are unsafe! We test our products according to EU legislation on the presence and % of materials considered hazardous and achieved a really good result. GOAL: By the end of 2018 90% of all products are PVC free. 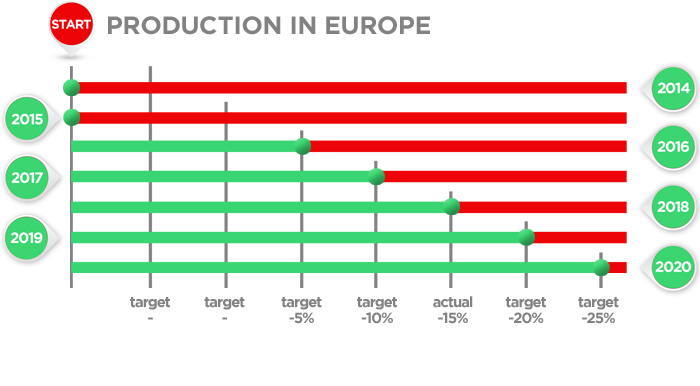 RESULT: In 2018 we achieved 80% PVC free products, just 10% short of our goal, but still a big achievement in an industry where PVC is still widely usedEliminate the use of PVC in all products by 2020. You are in or you are out, depending on how green you are. As a supplier it is not easy to do business with us. ISO 9001:2008 as well as ISO 14001:2004 certified, we have implemented a quality management system which guarantees product compliance. And with environmental and social compliance in mind, we push our suppliers to follow our footsteps. 2014 0% of our collection is manufactured in Europe. 2015 30% of our QES program is implemented. 2015 0% of our collection is manufactured in Europe. 2016 40% of our QES program is implemented. 2017 50% of our QES program is implemented. 2017 10% of our collection is manufactured in Europe. 2018 60% of our QES program is implemented. 2018 15% of our collection is manufactured in Europe. 2019 80% of our QES program is implemented. 2019 20% of our collection is manufactured in Europe. 2020 100% of our QES program is implemented. 2020 25% of our collection is manufactured in Europe. Corporate Social Responsibility (CSR) may be "hot" in China but regulations and standards are not always adequately enforced. Therefore we have set our own standards: our suppliers must agree to comply with the QES (Quality Environment Social) audit program. This program stipulates minimum levels of performance for environmental and social responsibility (such as demands that factories do not use child labor, pay minimum wages on time, comply with environmental regulations, provide safe working environment, etc.). Our audit program, fully based on the international BSCI standards helps us to take necessary actions when needed. In 2020 100% of the collection must be purchased from suppliers that are compliant to the XD QES audit program. We aim at managing and reducing the environmental impact of the transportation related to our activities and products including transportation into, within and from Xindao. We shall take the impact on the environment into consideration when deciding on or changing the mode of transportation and logistics. 1. From 2015 onwards Xindao will only use transport companies that have implemented a sustainability program. 2. We aim to move part of the manufacturing of our collection to Europe to drastically save transport emissions. A better world starts in our own office. Every Xindao office and every employee will have the goal to reduce it is impact on the environment. By the end of 2014 20% of all printed catalogues are eliminated. By the end of 2014 30% of all our booths are durable, recyclable and very cleverly made to minimize transport and waste. From 2014 onwards all cars purchased or leased by Xindao will be green cars. In 2014 Xindao will make available the full XD Design studio in Shanghai to solve an issue related to a worldwide environmental or social problem. Also, we will support community projects in Romania. Also, we will support community projects in China. And we will allow everyone that works with us to to spend two working days on voluntary work for a good cause. By the end of 2015 40% of all printed catalogues are eliminated. By the end of 2015 50% of all our booths are durable, recyclable and very cleverly made to minimize transport and waste. In 2015 Xindao will make available the full XD Design studio in Shanghai to solve an issue related to a worldwide environmental or social problem. Also, we will support community projects in Romania. Also, we will support community projects in China. And we will allow everyone that works with us to to spend two working days on voluntary work for a good cause. By the end of 2016 60% of all printed catalogues are eliminated. By the end of 2016 60% of all our booths are durable, recyclable and very cleverly made to minimize transport and waste. In 2016 all cars purchased or leased by Xindao will are green cars. All Xindao offices make use of Green energy. In 2016 Xindao will make available the full XD Design studio in Shanghai to solve an issue related to a worldwide environmental or social problem. Also, we will support community projects in Romania. Also, we will support community projects in China. And we will allow everyone that works with us to to spend two working days on voluntary work for a good cause. By the end of 2017 80% of all printed catalogues are eliminated. By the end of 2017 all cars purchased or leased by Xindao are green cars.All Xindao offices make use of Green energy. In 2017 Xindao will make available the full XD Design studio in Shanghai to solve an issue related to a worldwide environmental or social problem. Also, we will support community projects in Romania. Also, we will support community projects in China. And we will allow everyone that works with us to to spend two working days on voluntary work for a good cause. By the end of 2018 100% of all printed catalogues are eliminated. They will only be online. By the end of 2018 100% of all our booths are durable, recyclable and very cleverly made to minimize transport and waste. In 2018 all cars purchased or leased by Xindao are green cars. All Xindao offices make use of Green energy. In 2018 Xindao will make available the full XD Design studio in Shanghai to solve an issue related to a worldwide environmental or social problem. Also, we will support community projects in Romania. Also, we will support community projects in China. And we will allow everyone that works with us to to spend two working days on voluntary work for a good cause. In 2019 all our catalogues are online only. In 2019 all our booths are durable, recyclable and very cleverly made to minimize transport and waste. In 2019 all cars purchased or leased by Xindao are green cars. All Xindao offices make use of Green energy. In 2019 Xindao will make available the full XD Design studio in Shanghai to solve an issue related to a worldwide environmental or social problem. Also, we will support community projects in Romania. Also, we will support community projects in China. And we will allow everyone that works with us to to spend two working days on voluntary work for a good cause. In 2020 all our catalogues are online only. In 2020 all our booths are durable, recyclable and very cleverly made to minimize transport and waste. In 2020 all cars purchased or leased by Xindao are green cars. All Xindao offices make use of Green energy. By the end of 2020 all Xindao offices are paperless. By the end of 2020 all Xindao offices will use only furniture and decorations produced with environmentally friendly materials. In 20220 Xindao will make available the full XD Design studio in Shanghai to solve an issue related to a worldwide environmental or social problem. Also, we will support community projects in Romania. Also, we will support community projects in China. And we will allow everyone that works with us to to spend two working days on voluntary work for a good cause. Together we are Xindao. So together we are going to make a difference. Sharing the same values and the same eagerness to contribute to a better world, we will introduce programs to get everybody on board. To inform, educate and to inspire. And take everybody along on this journey we strongly believe in. Obviously we’re using FSC paper for everything we print. The next step is a more radical one: no more paper! By 2018 all our catalogues will only be online. Eliminate all printed catalogues by 2018. 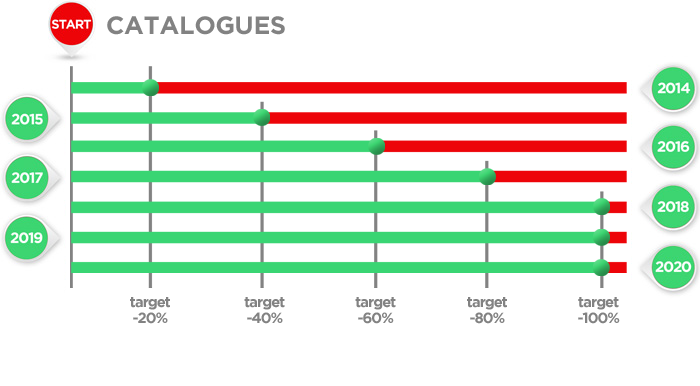 Eliminate 20% of the catalogues per year from 2014 onwards. By 2018 all our booths at trade fairs must be sustainable. Because they're durable, recyclable and very cleverly made to minimize transport and waste. Already ISO 14001 certified in Shanghai and in Romania in 2014, we will take the next step: we will implement the WWF Green Office program. Let's move to 2020 and look what we see: All Xindao offices will be paperless, all our cars will be green, the furniture we use will be eco friendly and we will use green energy only. By 2020 all Xindao offices will be paperless. Before 2018 all cars will be Green cars. By 2020 all Xindao offices will use only furniture and decorations produced with environmentally friendly materials. By 2015 all Xindao offices will make use of Green energy. How about our social responsibility? Once a year Xindao will make available the full XD Design studio in Shanghai to solve an issue related to a worldwide environmental or social problem. Also, we will support community projects in Romania. Also, we will support community projects in China. And we'll allow everyone that works with us to to spend two working days on voluntary work for a good cause. All above projects will be initiated in 2014 and executed in 2015. Sharing our progress, advertising our beliefs. We believe in open and honest communication. In transparency about our objectives and the steps we're making to achieve them. In 2014 Xindao will organize an event to evaluate our progress and discuss comments and improvements. Packaging, labeling and manuals help our customers to bring our green message across to the consumer. To compliment them with their sensible choice, educating them about our eco approach. In 2014 Xindao will publish our progress in a yearly report and in our Eco zine. A magazine to create awareness and influence environmentally friendly behavior. In 2015 Xindaowill organize an event to evaluate our progress and discuss comments and improvements. In 2015 Xindao will publish our progress in a yearly report and in our Eco zine. A magazine to create awareness and influence environmentally friendly behavior. In 2016 Xindaowill organize an event to evaluate our progress and discuss comments and improvements. In 2016 Xindao will publish our progress in a yearly report and in our Eco zine. A magazine to create awareness and influence environmentally friendly behavior. In 2017 Xindaowill organize an event to evaluate our progress and discuss comments and improvements. In 2017 Xindao will publish our progress in a yearly report and in our Eco zine. A magazine to create awareness and influence environmentally friendly behavior. In 2018 Xindaowill organize an event to evaluate our progress and discuss comments and improvements. In 2018 Xindao will publish our progress in a yearly report and in our Eco zine. A magazine to create awareness and influence environmentally friendly behavior. In 2019 Xindaowill organize an event to evaluate our progress and discuss comments and improvements. In 2019 Xindao will publish our progress in a yearly report and in our Eco zine. A magazine to create awareness and influence environmentally friendly behavior. In 2020 Xindaowill organize an event to evaluate our progress and discuss comments and improvements. In 2020 Xindao will publish our progress in a yearly report and in our Eco zine. A magazine to create awareness and influence environmentally friendly behavior. We encourage our customers to give feedback on our products and on our plan. We will organize a yearly event to evaluate our progress and discuss comments and improvements. Through packaging and labels we have a unique possibility to communicate directly to the end-consumer and try to educate and inspire them to also consider the environment. Apart from our yearly Eco’zine we will publish a yearly report on the achievement of the set goals and targets.